Four weeks after the first case of anthrax turned up in Florida, the identity of the architect of this first real campaign of biological terrorism is still a mystery and the U.S. administration seems to be fumbling in the dark. To the list of the initial suspects, Osama bin Laden and the Iraqi regime, have now been added the radical American right-wing groups. In spite of the growing number of cases of anthrax, mainly among postal workers, it appears that this bioterrorism campaign may well be limited to a small number of anthrax-infected letters sent by a U.S.-based cell, possibly—but not necessarily—with the support of Iraq. In the short history of bioterrorism only a few terrorist groups have attempted to acquire biological agents, and even fewer have actually attempted to use the agents. The number of incidents involving use or attempted use of biological agents is extremely small, especially when compared to the thousands of known terrorist incidents. The number of known victims from bio-terrorist incidents is also very limited and there have been almost no known fatalities. Some attacks have specifically targeted individuals, while others have focused on contamination of food and water. Most terrorist groups have used dissemination techniques unlikely to cause mass casualties. The Japanese terrorist cult Aum Shinrikyo is the only group known to have shown an interest in developing aerosol dissemination capability. An ICT in-depth research project on non-conventional terrorism has recorded 292 incidents of biological, chemical, radiological and nuclear terrorism between 1970-98. Among these, only 41 incidents could be classed as bioterrorism. However, the number of incidents has been increasing steadily over the years; while there were only ten bioterror incidents in the 1970s, during the 1980s there were thirteen. From 1990 to 1998 this number had risen to eighteen. (see annexes I, II). According to the exhaustive database on bioterrorism published by Seth Carus of the National Defense University, from 1900 to 1999 there were 142 biological attacks, of which only 23 were certain bioterrorism (compared with 46 bio-crimes and 73 undefined cases). Many of the bioterrorism incidents occurred in the U.S. and were perpetrated by radical right-wing elements—the only organizations that openly publish material about biowarfare and bioterrorism. Much of this material has been published on the Internet, Of the 23 real bioterrorism incidents registered by Carus, only 5 involved actual use of biological agents. Only the Rajneshee cult incident in 1984 resulted in a relatively high number of victims; though there were no deaths, 751 people became sick from food poisoning at a restaurant in Oregon, U.S.. The only known fatal cases reported in the literature are those of biocrimes (nine cases from 1900 today) and accidents (in 1979, a release of anthrax spores from a Soviet biological weapons facility in Sverdlovsk killed at least 66 people). Aum Shinrikyo (AUM)—the Japanese terrorist cult that carried out the March 1995 sarin gas attack on the Tokyo underground—had a primitive biological weapons program, although they had a team of some ten very well-prepared physicists led by Seichi Endo, a graduate-level molecular biologist with background in genetic engineering. In 1990, they used a large truck with a compressor system and six hidden vents in order to spread botulinum strain, unsuccessfully, at the Tokyo’s international airport and the U.S. naval bases in Yokohama and Yokosuka. They also attempted to spread botulinum at the wedding of the Japanese crown prince in 1993. In 1993 AUM tried during four days to spread anthrax from a high building with a steam generator, sprayer and fans—again without result. They were not aware that their specialists had in fact been working with a veterinary vaccine strain, rather than a virulent one. After the failure of its biological program, the Aum Shinrikyo concentrated on the development of a sarin gas capability. Thus, biological terrorism has played a very marginal role, until now. The investigation of the current cases of anthrax in the U.S. The investigation into the current anthrax attack began when Robert Stevens, a photo editor who worked at the supermarket tabloid The Sun, died on October 5 of inhalation anthrax. Traces of anthrax bacteria were found at his workstation at American Media Inc. (AMI) in Boca Raton, Florida (see the description of the sequence of events in annex III). Investigators linked the apparent bioterror attacks to three sites: American Media Inc. in Boca Raton, Fla., NBC News in New York, and Senator Daschle’s office in Washington. Preliminary DNA analysis showed that the same anthrax strain was sent to the New York and Florida sites. The letters sent to Daschle and NBC News anchor Tom Brokaw were also similar. Lastly, the attacks on Daschle and AMI involved unusually small anthrax spores that were apparently designed to be more easily inhaled. The FBI also investigated the route of a mail carrier in west Trenton, N.J, who came down with cutaneous anthrax. There was some speculation that the letter responsible for the mail carrier’s illness may have been mailed from somewhere along her route. The timing indicated that she may have handled the letter to NBC News anchor Tom Brokaw, postmarked in Trenton September 18. However, more than 20 tests conducted at the West Trenton post office and in mailboxes and bins along her route turned up negative, leading FBI officials to focus their inquiries on a distribution center in Hamilton Township that feeds into West Trenton. According to the Washington Post, FBI agents and investigators from the Food and Drug Administration’s criminal investigation unit also questioned pharmacies in the Trenton area in search of customers who may have obtained large quantities—a supply of 30 to 60 days—of the anti-anthrax drug Cipro. The idea was that anyone intending to distribute anthrax would need a large supply of the antibiotic. The sender of the letters to Daschle and Brokaw was sophisticated enough to put a seemingly innocuous return address on one of the letters—the Greendale School in Franklin Park, N.J.—which turns out not to exist. On October 25, Office of Homeland Security Director Tom Ridge declared that the bacterial spores responsible for the anthrax outbreaks in Florida, New York and Washington belong to the so-called Ames strain, a subtype of the anthrax bacterium commonly used for research at universities around the world, as well as by the U.S. military. There had been reports that the spores had been treated with a chemical additive in order to augment their effectiveness, making them more likely to cause serious disease. Although officials confirmed that the spores sent to Senator Daschle were very small, highly concentrated and of high quality, they declined to comment onnews reports that the spores had been treated with the alleged additive, reportedly so sophisticated that it almost certainly came from the United States, Iraq or the former Soviet Union. According to the Washington Post, a government official with direct knowledge of the investigation said that the totality of the evidence suggested it is unlikely the spores were originally produced in the former Soviet Union or Iraq. Bin Laden’s network the first suspect. U.S. President George Bush speculated that Osama Bin Laden, whose al-Qaida network was blamed for the September 11th terror attacks, was also behind the anthrax attacks. “There may be some possible link. We have no hard data yet but it’s clear that Mr. Bin Laden is an evil man,” he said. Indeed, American and European intelligence agencies had warned immediately after the September 11 attacks that they had information leading to the possibility that a second wave of terrorist attacks was planned by bin Laden. Bin Laden’s video broadcast by Al-Jazeera TV after the start of the Western campaign in Afghanistan, also contained open threats of dreadful new attacks against the U.S. The timing of the anthrax campaign, which began somewhere around September 18, fits in with this evaluation (see annex IV on bin Laden’s attempts to acquire weapons of mass destruction). In an article published on October 16, 2001 by the Sunday Mail, British terrorism expert Simon Reeve claimed that al-Qaida agents in Albania had obtained vials of anthrax and botulinum toxin in the Czech Republic. Reeve referred to transcripts of Egyptian interrogations of captured members of al-Qaida. But according to the Czech media, U.S. experts investigating cases of occurrence of anthrax in the United States have not linked the origin of the substance with the Czech Republic. Czech army medical service chief Jan Petras, said upon returning from a visit to the U.S. that according to his evaluation, supported by certain evidence, the anthrax used in the U.S. attacks was made in the U.S. The San Francisco Chronicle claimed that testimony given during a terrorism trial two years ago in Egypt was rich with details about bin Laden’s alleged efforts to acquire various germs. Among the biological agents purchased from countries in Eastern Europe by bin Laden’s top aide, Egyptian Islamic Jihad leader Ayman al-Zawahiri, were anthrax and the deadly Ebola virus, the Chronicle said. Significantly, recent reports in the British press, have claimed that followers of Osama Bin Laden planned to carry out a chemical weapon attack in Europe using a “poisonous invisible gas,” possibly cyanide. Reportedly, Italian anti-terrorist police recorded conversations taking place in an apartment outside Milan that served as a safe house for an al-Qaida cell. According to the Sunday Times, terrorists in Britain, Germany and Italy plotted to use tins of tomatoes to transport “a liquid that suffocates people”. The plan was foiled when a Libyan at the center of the plot was arrested in Munich. One theory is that the group planned to spread the poison in an American government building in London or Rome. Convicted Algerian terrorist Ahmed Ressam testified during his trial in the U.S. that experiments using poisonous cyanide gas pumped into an office building ventilation system took place at training camps run by bin Laden in Afghanistan. It is clear by now that some of the letters bearing anthrax in the United States were sent from Trenton, New Jersey. It should be remembered that Jersey City was the cradle of the plot for the first bombing of the World Trade Center, in 1993, by a cell led by Sheikh Omar Abdel Rahman. Likewise, the anthrax infection in Boca Raton, Florida, happened not far from the apartments where some of the hijackers of the September 11 planes lived and trained. On September 28, U.S. government officials expressed concern about a plant located in Afghanistan that manufactures 34F2 Sterne, a non-virulent strain of anthrax, only suitable for use in the anthrax vaccine. The plant, which was renovated in 1997 with assistance from the International Committee of the Red Cross, manufactures about 10,000 doses of the vaccine per year. Officials are trying to assess whether the facility has the proper equipment and the lethal strains of anthrax necessary to produce biological weapons. Leading U.S. intelligence sources in the CIA and the Defense Department have claimed that there is evidence of a state sponsor in the anthrax cases, and that this evidence hinges on the fact that the victims in Florida were afflicted with the airborne form of the disease. U.S. intelligence believes Iraq has the technology and supplies of anthrax suitable for terrorist use. “They aren’t making this stuff in caves in Afghanistan,” a CIA source quoted by The London Observer said. “This is prima facie evidence of the involvement of a state intelligence agency. Maybe Iran has the capability. But it doesn’t look likely politically. That leaves Iraq.” The paper reported that scientists investigating the attacks believe the bacteria used to be similar to the “Ames strain” of anthrax originally cultivated at Iowa State University in the 1950s and later given to labs throughout the world, including Iraq. According to the Observer some in the U.S. Administration would like to use evidence that Saddam Hussein was involved, even indirectly, with the 11 September hijackers, in order to press their case for strikes against Iraq. It should be remembered that U.S. and Czech intelligence officials have confirmed that Mohamed Atta, one of the leaders of the hijackers, met with an Iraqi intelligence agent, Ahmed Samir al-Ahani, last Autumn in Prague. Al-Ahani is a former consul, who was later expelled by the Czechs for activities not compatible with his diplomatic mission. The Czechs are also examining the possibility that Atta met a former director of Saddam’s external secret services, Farouk Hijazi, at a second meeting in the spring 2001. Hijazi is known to have met Bin Laden. Former CIA director James Woolsey recently visited London on behalf of the Defense Department to discuss further evidence of Iraqi involvement in the September11 attacks. In a biological threat assessment issued last January, U.S. intelligence agencies reported that “more than a dozen states” were pursuing germ warfare capabilities. Among them were Iraq, Iran, Libya, North Korea and Syria. But none has been shown to have perfected an anthrax weapon. Iraq is also suspected of at least trying to engineer its own anthrax strains. According to the report, even human-designed strains, while not on file with the Los Alamos laboratories, which keeps track of the various strains, could still be traced back to parent types. As early as October 18, American officials claimed that no evidence had turned up linking the anthrax attacks to foreign terrorists; one official even said that there was evidence that might suggest a domestic source. The preliminary tests on the New York and Florida strains indicated that the strain was related, if not identical to, the Ames strain, developed in the United States. Attorney General John Ashcroft said the anthrax attacks could be the work of a group and individuals working independently, possibly attempting to divert the attention of investigators by perpetrating anthrax hoaxes. In recent days, top FBI and CIA officials leaked to the Washington Post that they believed that the anthrax attacks on Washington, New York and Florida were likely the work of one or more extremists in the United States, probably not connected to Osama bin Laden’s al-Qaida terrorist organization. According to the Post, none of the 60 to 80 threat reports gathered daily by U.S. intelligence agencies has connected the envelopes containing anthrax spores to al-Qaida or other known organized terrorist groups, and the evidence gleaned from the spore samples so far provides no solid link to a foreign government or laboratory. At present,the FBI and U.S. Postal Inspection Service are reportedly considering a wide range of domestic possibilities, including right-wing hate groups and U.S. residents sympathetic to the causes of Islamic extremists. One official cited by the paper said that the only significant clue pointing to the involvement of foreign terrorists is the conclusion of FBI behavioral scientists, who believe that whoever wrote the three letters delivered to Senator Daschle, NBC News and the New York Post did not learn English as a first language. It is noteworthy that in the past a high number of American domestic extremist groups have attempts to use biological weapons in the U.S., although many of these incidents were little more than threats, and none have been particularly successful. Some food poisoning efforts have succeeded in causing illness, but no deaths. The Oklahoma City bombing showed that “loners” and leaders of ill-informed extremist groups could pose a major threat. Virtually all of the killings attributed to such elements to date have been carried out using automatic weapons and bombs, but there is no clear reason that this should be true in the future. According to Anthony Cordesman, a leading American researcher, nothing precludes these people from using simple chemical devices and biological weapons in the future. Larry Wayne Harris, of Lancaster, Ohio, a microbiologist and alleged member of the Aryan Nations, in 1995 published a research paper entitled “Bacteriological Warfare – a Major Threat to North America. What You and Your Family Can Do Defensively Before and After.” In 1995 Harris was charged with buying bubonic plague bacteria by mail and convicted of possessing a biological agent intended as a weapon. In 1998, he was convicted of violating probation for the 1995 conviction, when he threatened to acquire anthrax for use as a weapon. Former Oklahoma Ku Klux Klan member Dennis Mahon, was also a devotee of the Aryan Nations community in eastern Oklahoma known as Elohim City. Mahon boasted of his connections to Saddam Hussein’s intelligence service, for which he claimed to have worked during the Persian Gulf War, organizing rallies for Iraq. In an interview with a Brazilian television crew, Mahon unrolled and proudly held up a poster of Yasir Arafat, reportedly one of his heroes. The Washington Post reported that more than 130 clinics and doctor’s offices across the U.S. that provide abortion services have recently been sent letters threatening death by anthrax. Almost all the letters contained a suspicious brown or white powder, and almost all of them came in business envelopes with false return addresses from the “U.S. Secret Service” or the “U.S. Marshals Service.” Of those that were opened, several contained the message: “Army of God, you’ve been exposed to anthrax, you’re dead.” So far, none of the letters have tested positive for anthrax microbes. The anthrax letters in the U.S. have caused anxiety worldwide, although it is clear that the vast majority of the incidents outside the U.S. have been hoaxes. Among the official claims of anthrax cases outside the U.S. is one in Nairobi. Kenya’s health minister reported that an envelope sent from Atlanta to a private Kenyan citizen tested positive for anthrax spores. The letter was mailed September 8 from Atlanta via Miami and was received in Nairobi on October 9. It was opened on October 11. The letter contained white powder and pieces of cloth. Authorities in Kenya are investigating two other envelopes containing white powder, including one sent to a UN office in Nairobi. So far none of these cases has been acknowledged as an authentic anthrax attack. A letter sent to the New York Times office in Rio de Janeiro and a travel brochure sent to a family in Buenos Aires, both with U.S. postmarks, was reported to have tested positive for anthrax. The health authorities in Argentina said the existence of anthrax was confirmed by a second, more comprehensive test of the brochure, which was in an envelope with a Miami postmark. The New York Times cited health authorities at the Oswaldo Cruz research Institute in Rio de Janeiro as saying that initial tests detected anthrax in a fine powder contained in an envelope received by their offices. Similar incidents occurred around the world, as reports of letters with white powder possibly containing anthrax appeared in Japan, Pakistan and France. The British High Commission in Islamabad, Pakistan rushed one of its employees to the hospital after he came into contact with a letter containing white powder. Results were also pending on powder in letters sent to the offices of President Jacques Chirac and Prime Minister Lionel Jospin at the French presidential palace and the Premier’s office, French Europe Radio 1 reported. Sources in Morocco said suspicious boxes and letters sent to the U.S. Embassy in Rabat and businessmen in Casablanca proved to be anthrax-free. Meanwhile, in Beirut, two letters containing a bag full of powder reached two different houses, raising fears of an anthrax attack. The modus operandi used during the present campaign of anthrax letters is not a mass destruction attack but rather a series of symbolic attacks against individuals representing the media and American power centers. It has even been speculated that all of the cases of anthrax exposure in the Washington area were the result of the one letter sent to Senator Daschle. Whether this is true is still not clear. What is clear at this stage of the investigation is that all the tainted letters sent within the United States—probably all from New Jersey—were sent to targets in the U.S., beginning a week after the September 11 attacks. As for the cases of anthrax in Florida, they could be the result either of a letter opened by an AMI employee but not reported to the authorities, or of another kind of direct infection which has not been yet proposed by the investigators. The low level of technology employed, while using a relatively virulent strain of the bacteria, could imply that the perpetrators do not have the sophisticated means to disseminate the anthrax as an aerosol. Alternately, if Iraq is involved, it could mean that they either did not want to introduce the necessary facilities into the U.S., or that they had difficulty doing so. Bin Laden’s network would have no difficulty preparing such an infrastructure, as it prepared the much more complex operation of the pilots training and hijackings in the U.S.. The same is true for the right-wing radicals, who have, for many years, been trying to obtain biological agents, and who have been outspoken with regard to the necessity of using them in what they call an “inevitable civil war” with the government. The two letters to Senator Daschle and anchorman Brokaw, containing threats to the U.S. and Israel and the expression “Allah is Great”, could be prepared by anybody aware of the Islamist phraseology. The real question is. who provided the more advanced strain of anthrax to the perpetrators. Unfortunately, the information in the hands of the investigators appears to be contradictory and inconclusive; this is even more true of the information reaching the general public. It would seem that there is disagreement among the various scientists and military biological warfare specialists as to the nature and hazard of the anthrax involved. As long as there is no proof that bin Laden’s men or American extremist elements have developed the capability to produce advanced forms of anthrax—something that they have not had up to now—the Iraqi track is still valid. The regime of Saddam Hussein is the only rogue element which has used chemical weapons against its enemies on a massive scale. Saddam did not hesitate to use chemical weapons against Iran in the Iran-Iraq war, nor even against Iraqi citizens, as shown by the bombing of the Kurdish town of Halabja in northern Iraq in 1988. Furthermore, Iraq is the only state which has the motivation and the stamina to support such an operation, provided it could avoid being seen to be directly involved. Sequence of events concerning the spread of anthrax in the U.S.
Robert Stevens, a photo editor of a Florida tabloid, was admitted to JFK Medical Center in Atlantis, feverish and confused, at 2 a.m. on Tuesday, October 2. A few hours later, Stevens had lost consciousness. On October 4, laboratories in Jacksonville and Atlanta confirmed the diagnosis of anthrax. Stevens had become the first American in a quarter century to come down with inhalation anthrax and the first known fatality of bioterrorism. Health officials immediately began testing people who worked in, or had recently visited, the AMI building. Ernesto Blanco, 73, worked in the mailroom of the building. He became ill on Monday, October 1 and on October 7 tested positive for anthrax. So did Stevens’s keyboard at AMI. That proved that the exposure was in the workplace. More than 1,000 people were tested in the aftermath of the building’s closing. By October 10, Blanco’s condition had improved and he was moved out of the intensive care unit. At the same time, a 35 year-old woman who worked at AMI tested positive for anthrax exposure. On October 4, Health and Human Services Secretary Tommy G. Thompson said at a daily White House briefing for reporters that the incident at the AMI building was an isolated case. According to Florida Department of Health documents, the investigation was under the control of the FBI as of October 7, after the diagnosis of Blanco. Yet the department did not publicly declare the infections as potential criminal acts. After days of characterizing the incident as a health probe into an isolated incident, federal authorities reversed course on the night of October 4, publicly acknowledging that they believed the act was deliberate and the investigation became a criminal one. On October 12, it was announced that Erin O’Connor, an aide to NBC anchor Tom Brokaw, has contracted the cutaneous, or skin form of anthrax, marking the first appearance of the disease outside of Florida. She was treated with antibiotics and was expected to make a full recovery. O’Connor reported receiving a letter on September 25 filled with a suspicious powder addressed to Brokaw. The letter was first opened by the news desk, where it was handled by several people before being delivered to Brokaw’s assistant. The enveloped contained a was a single-page letter and about a tablespoonful of powder. The letter war reportedly a general, inflammatory criticism of Brokaw. FBI officials said the letter was a postmarked from St. Petersburg, Fla. There were some similarities between the handwriting in the NBC letter and a suspicious letter received at the New York Times, which also was mailed from St. Petersburg, but tested negative to anthrax. Tests on the powder in the NBC letter proved negative, but a skin biopsy came back positive. As it turned out, the letter in question turned out not to be the one containing anthrax; the actual tainted letter was one postmarked Trenton, New Jersey, received September 18. On October 12, a letter from Malaysia to a Microsoft office in Reno, Nevada initially tested positive for anthrax, but a second, more comprehensive test came back negative. The letter originally contained a check sent from the company to one of its vendors in Malaysia. An employee contacted authorities after opening the returned letter, which contained the check and pornographic material. After a third test the letter was again considered to contain anthrax, but on October 20 it was announced definitively that the letter did not, in fact, contain anthrax. On October 15, the Washington office of U.S. Senator Tom Daschle received a letter which tested positive for anthrax. The anthrax found in the letter appeared to be one of the more “potent” forms and was deemed to be the work of experts. Preliminary testing indicated that the contaminated powder was refined enough to disperse easily through the air, increasing its potential as a deadly weapon. The FBI said that the handwriting was the same on the letter sent to Mr. Daschle and the one sent to NBC news anchor Tom Brokaw. Both letters were sent from Trenton, New Jersey. The two letters posted in Trenton were postmarked 18 September, and it is not clear why they took so long to reach their destination. On the same date the seven-month old son of an employee at ABC News in New York contracted cutaneous anthrax. Two new cases of cutaneous anthrax were announced on October 18. One was a Trenton, New Jersey postal worker, the other was an assistant to CBS News anchorman Dan Rather. This brought to five the total number of anthrax cases confirmed in the United States at that date. On October 20, anthrax tests were ordered for more than 2,100 postal service workers in the Washington, D.C. area following the diagnosis of inhalation anthrax in a postal worker hospitalized in Virginia. She had reportedly handled the letter or letters sent to Congress containing anthrax spores. Evidence of anthrax spores was found in a mail bin at the House of Representatives Ford office building. Spores were also found in offices of both the House and Senate. As of October 20, there were six confirmed cases anthrax contracted thcuts or abrasions on the skin; all those exposed to anthrax in that way were expected to recover. At least 30 people tested positive for anthrax exposure overall in eight separate locations. On October 22, Homeland Security Director Tom Ridge confirmed that two Washington postal workers had died of inhalation anthrax. Two other postal workers from the Brentwood mail facility in New Jersey, were hospitalized with confirmed inhalation anthrax infections. The Brentwood facility serves Capitol Hill. Meanwhile, investigators in New York were checking into two letters sent to the New York Post, which on October 21 reported that a second letter containing anthrax had been found at its offices. Post Editorial Page Assistant Johanna Huden tested positive for cutaneous anthrax. Similar infections occurred at CBS, NBC and ABC news networks as well. There were at least two confirmed cases of cutaneous anthrax among New Jersey postal workers, and another case was suspected. On the New Jersey end of the anthrax investigation, spores were found at the main Trenton post office in Hamilton, according to the New Jersey Department of Health and Senior Services. Preliminary tests on 13 of 23 samples collected by the FBI tested positive for anthrax. U.S. Surgeon General David Satcher claimed that the strains of anthrax studied so far were very similar, suggesting—though not guaranteeing—that they came from a single source. On October 26, CNN reported that traces of anthrax were found in a building at the Central Intelligence Agency in Langley, Virginia, where incoming mail is sorted. The amount of anthrax detected was insignificant, but the building was closed until further testing could be done. Meanwhile, an employee of the U.S. State Department tested positive for inhalation anthrax, while a second employee suffering from flu-like symptoms was being tested for the disease. Meanwhile, the U.S. Supreme Court shut its doors for the first time in 66 years, while the circle of people who were urged to begin taking antibiotics was widened. Health authorities prepared to dispense medication to thousands of people who sort and deliver mail at government and private offices in the Washington area. Traces of anthrax were reported at two mailrooms at Walter Reed Army Medical Center in Northwest Washington. The discovery came a day after traces were found in the mailroom of the Walter Reed Army Institute of Research in Silver Spring. The latest discoveries of anthrax contamination resulted from continued environmental testing by government agencies. According to a number of reports, Osama Bin Laden has attempted to acquire weapons of mass destruction, along with capabilities to develop such weapons. The Italian newspaper Corriere della Sera reported in May 1998 that Osama’s representatives bought three chemical and biological agent production laboratories in the former Yugoslavia. In addition, the organization received radioactive material and pesticides from Ukraine, and hired a number of Ukrainian experts (chemists and biologists) whose job would be to optimize the poisons and train the activists. According to this information, the first factory had already been set up in a well-equipped camp near Kandahar in Afghanistan, and the second was nearing completion at Zenica, the Bosnian village used as a training base for Muslim militants during the war in Bosnia. First on his shopping list was a Russian nuclear warhead he hoped to buy on the black market. He abandoned that effort when no warhead could be found. Instead, his agents began scouring former Soviet republics for enriched uranium and weapons components that could be used to set off the fuel. But Osama’s buyers weren’t physicists, and the people selling to him were trying to rip him off, according to an U.S. Energy Department official. The enriched uranium they were offered turned out to be low-grade reactor fuel unusable for a weapon. Frustrated, bin Laden instead settled on chemical weapons, which are easier to manufacture. Although U.S. intelligence officials have been unable to pinpoint hidden caches, they suspect that during a five-year stay in Sudan before moving to Afghanistan in 1996, bin Laden tested, with the help of Sudanese officials, nerve agents that would be dispensed from bombs or artillery shells. The London-based Arabic paper Al Wattan El Arabi claimed in January 1999 that bin Laden and the Iraqi regime had arrived at an agreement to fight together against the U.S., including cooperation in the field of biological and chemical weapons, which would be produced in bin Laden’s laboratories, with the assistance of Iraqi specialists. The London Al-Hayat claimed in April 1999 that a senior militant of the Egyptian Jihad organization, then on trial in Egypt, had declared that bin Laden already has biological and chemical weapons and that he intended to use them against 100 American and Israeli targets. The U.S. indictment against Osama bin Laden of November 1998 states that from 1993 on, bin Laden and other members of his al-Qaida organization made efforts to obtain components of nuclear weapons and to produce chemical weapons. There are no details concerning these efforts nor their results. The testimonies of those involved in the bombings of the U.S. embassies in Nairobi and Dar-es-Salam, have revealed only sketchy information. Wadih El Hage tried to obtain chemical weapons and/or their components at various times in the l990’s. Jamal Ahmed Al-Fadl, the government’s first witness, described the group’s desire to acquire chemical weapons and uranium for an atomic bomb, without providing many details. He testified that a fellow al-Qaida member told him the group was trying to help Sudan’s ruling National Islamic Front manufacture chemical weapons for use in a civil war against Christian forces in the country’s south. He also testified that a Sudanese military officer offered to sell uranium to al-Qaida for $1.5 million and showed bin Laden’s agents a two-foot cylinder that purportedly contained the material, along with documents saying it came from South Africa, a former nuclear power. Fadl said he received a $10,000 bonus for arranging the sale but did not know whether it was ever consummated. Nor did he know whether the cylinder held bomb-grade uranium, leaving open the strong possibility that the deal was a scam. Mamdouh Salim is the person that al-Qaida turned to when it was prepared to spend a million and a half dollars for the components of nuclear weapons. During his trial in New York, Ahmed Ressam testified that experiments using poisonous cyanide gas pumped into an office building ventilation system took place at training camps run by bin Laden in Afghanistan. 1. 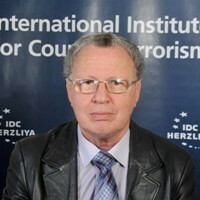 Ely Karmon and Boaz Ganor, Non-conventional Terrorism (unpublished research project), The International Policy Institute for Counter-terrorism, The Interdisciplinary Center (Herzlyia, August 1999). The term incident refers to a broad range of events and does not mean specifically terrorist attacks. See annex II. 2. See W. Seth Carus, Bioterrorism and Biocrimes. The Illicit Use of Biological Agents in the 20th Century (Working Paper), Center for Counterproliferation Research, National Defense University (Washington, July 1999 revised edition), pp. 8, 12. 3. One of the conclusions of the ICT research was that extremist right wing elements do not have moral restraints in perpetrating indiscriminate acts of terror. Members of these groups are the only ones who dare propose openly to use biological weapons as a strategic weapon. However, in most of the cases these were very small groups or even individuals belonging to some small faction. Another conclusion was that a developed industrial-technological infrastructure is necessary for the development of a non-conventional capability by a terrorist organization . 4. The ICT research also registered 5 cases of bioterrorism, but due to differences in methodology and definition between the two approaches, not all the reported incidents are the same. 5. The one serious bioterrorism attack that occurred in the United States involved the Rajneeshee, a religious cult, who had established a large commune in Wasco County, Oregon. Relations between the county’s residents and the cult were extremely contentious, leading the cult to adopt a plan to take over the county by manipulating the results of the November 1984 election. They decided to make the opposing voters sick and thus unable to vote on election day. To make the people of Wasco County sick, the cult grew Salmonella typhimurium, a diarrheal disease, from a culture purchased from a medical supply house. On August 29, they gave water laced with S. typhimurium to two county commissioners the Rajneeshee considered hostile. Both became sick; one required hospitalization. Although the Rajneeshee were suspected of deliberately poisoning the commissioners, there was no evidence to support such a claim and there was no criminal investigation. In September 1984, the Rajneeshees contaminated the salad bars of 10 restaurants in The Dalles. They spread the disease by pouring vials of media containing the organism over the foods. The result was an estimated 751 cases of salmonellosis. Despite the success of this effort, no follow-on attacks were made. The Rajneeshee abandoned their efforts to take over Wasco County by early October, when publicity and legal pressure made it evident they would fail. Two of the Rajneeshees were eventually convicted for their involvement in the plot. 6. See Seth Carus, Bioterrorism and Biocrimes, pp. 199-203. 7. See The Washington Post, October 21, 2001. 8. See Amy Smithson and Leslie-Anne Levy, Ataxia. The Chemical and Biological Terrorism Threat and the US Response, The Henry Stimson Center, Chemical and Biological Weapons Nonproliferation Project, Report no. 36, October 2000, pp. 75-80. 9. See Washington Post, October 18, 2001. 10. Ibid., October 19, 2001. 12. Ibid., October 26, 2001. 13. See BBCNews, October 16, 2001. 14. Only two reference laboratories in the Czech Republic--in Ostrava and Hradec Kralove, respectively--avail themselves of bacteria that could cause botulism or anthrax. The Czech police and the Security Information Service (BIS) are inquiring into these suspicious business deals. See Prague Hospodarske Noviny, September, 18, 2001 (FBIS-EEU-2001-0918). 15. See Prague CTK, October 15, 2001 (FBIS-EEU-2001-1015). 16. The Egyptian journalist Mohammed Salah, of the newspaper al-Hayat, told the Chronicle that he had interviewed a high-ranking member of the Islamic Jihad, Ahmad Salamah Mabruk, who was among 107 defendants in a 1999 Egyptian terrorism trial. Salah told the Chronicle that in his opinion this was a big scoop, but the Americans didn”t read this article. Salah also claimed that Mabruk revealed that bin Laden and al-Zawahiri had compiled a list of 100 targets worldwide that were linked to the United States or Israel. See UPI, citing The San Francisco Chronicle, October 21, 2001. 17. See The Sunday Times, October 14, 2001. 18. The information leaked to the media, is based on two documents: Procura della Repubblica presso il Tribunale Ordinario di Milano, Fermo di Indiziato di Delitto (order of arrest against seven Tunisian and one Iraqi citizens ), April 3, 2001; and Tribunale civile e penale di Milano, Ufficio del Giudice per le indagini preliminary, Ordinanza di applicazione di midure cautelare (order of imprisonment against five Arab citizens), three Tunisians, a Lybian and an Egyptian), October 5, 2001. 19. The suspects discussed getting 10 litres of the poison, enough to kill thousands if released indoors. The tins of tomatoes could have been used to transport cyanide crystals before they were dissolved into a liquid, which could then be dispersed through the ventilation ducts. If large quantities were available, the vapor produced could kill many occupants of a building within 10 minutes. 20. See The Sunday Times, October 14, 2001. 21. See The San Francisco Chronicle, October 21, 2001. 22. See The New York Times, September 28, 2001. 23. See The Observer, October 14, 2001. 26. See Washington Post, October 18, 2001. 27. See AP, October 18, 2001. 28. See Washington Post, October 27, 2001. 29. The FBI reported that there were 37 cases involving chemical and biological weapons in 1996, and 74 cases in 1997, 22 of which were related to biological agents. There were 181 cases in 1998, 112 of which were biological. As of late May 1999, there had been 123 cases in 1999, 100 of which were biological. In 1998 and 1999 combined, over three-quarters of the cases opened threatened the release of biological weapons. The most common threat was anthrax. Most of these cases can be dismissed as mere threats and extortion attempts, often by deeply disturbed “loners.” FBI sources do indicate, however, that some involve relatively well-equipped home labs, and that there were some successful efforts to produce ricin, botulinum, and anthrax. See Robert M. Burnham, Chief, Domestic Terrorism Section, FBI, before the House of Representatives Subcommittee on Oversight and Investigations, May 20, 1999, cited in Anthony H. Cordesman, Iraq and other Threats to the US Involving Weapons of Mass Destruction, Center For Strategic And International Studies, Washington, October 17, 2001, p. 88. 33. See in Nationalist Observer, June 2000. 34. See the article at http://www.google.com/search?q=cache:3g5ut6poQCk:norden1.com/~hawkins/CIVIL.HTM+Larry+Wayne+Harris&hl=en&start=9. 35. Harris and William Leavitt Jr. were arrested a week before in Nevada and charged with possessing a biological agent for use as a weapon. FBI tests found the material seized from the men was safe anthrax vaccine rather than military-grade anthrax capable of inflicting widespread deaths. Ohio authorities also said that substances found in Harris' Lancaster home in a search uncovered only non-lethal bacteria, including an anthrax spore vaccine. Leavitt, a civic leader in his southern Nevada town, was released from jail on his recognizance. The arrests of Leavitt and Harris in Henderson, Nev., triggered a nationwide scare about biological weapons. See AP, February 24, 1998. 36. See William F. Jasper, Black and Red Terrorist Internationals,The New American Magazine, Vol. 14, No.19, September 14, 1998. 37. See Washington Post, October 27, 2001. 38. See Washington Post, October 21, 2001. 39. Since October 1, most of the 2,300 reports in the US of substances feared to be anthrax have been false alarms or practical jokes, FBI Director Robert Mueller said. Ibid., October 27, 2001. 40. See CNN, October 18, 2001. 41. See Washington Post, October 20, 2001. 42. See UPI, October 21, 2001. 43. Federal health officials said on October 26 that a new case of pulmonary anthrax in a man who worked at a State Department mail facility in Virginia has persuaded them that more than one contaminated letter may have been sent to the Washington area. Health experts previously believed that a single letter, sent to the office of Senate Majority, likely caused all the anthrax reports in the Washington area as it came in contact with other pieces of mail in the system. However, ongoing searches of undelivered mail to the US Capitol and other government buildings has turned up no other letters laced with anthrax, leading FBI officials to assume that the Daschle letter may still be the only local source. See Washington Post, October 27, 2001. 44. The fact that the attackers used mail as a vector reveals some of the limitations of anthrax as a weapon. Despite the ease with which anthrax bacteria can be obtained and grown, “weaponizing” the spores is much harder. The relatively refined sample sent to the office of Senate Majority Leader Tom Daschle did not necessarily meet the milling specifications for weapons-grade anthrax, according to Army researchers. See Stratfort.com. 45. White House spokesman Ari Fleischer declared October 26, that investigators believe a broad range of people are capable of the crime. “The quality anthrax sent to Senator Daschle’s office could be produced by a Ph.D. microbiologist and a sophisticated laboratory,” he told reporters. US officials said the evidence so far does not point to either Russia or Iraq. However, FBI checks of private and government laboratories in the United States have not yet revealed any missing anthrax stockpiles, disgruntled scientists or other suspicious circumstances, one top official said. See Washington Post, October 27, 2001. 46. The description of the Boca Raton events is based on Washington Post Staff Writers Rick Weiss and Jo Becker, October 14, 2001. 47. While the anthrax scare reverberated across the United States, it was felt most intensely in New York. There were reports of a suspicious substance at Nasdaq and a suspicious package at the Empire State Building. New York Times reporter Judith Miller opened a letter that contained a hate-filled message and white powder, which tested negative for radioactive and chemical substances. As public concerns grew, officials urged people to be cautious about handling particular items of mail. See New York Times, October 13, 2001. 49. See Reuters, October 21, 2001. 50. See BBCNews, October 16, 2001. 51. This information contradicts previous one, which claimed that the letter to NBC was sent from St. Petersburg, Fla.. See above. 52. See UPI, October 18, 2001. 53. Ibid.. October 21, 2001. 54. Ibid., October 22, 2001. 55. Ibid., October 26, 2001. 56. See Washington Post, October 27, 2001. 57. See Douglas Waller, Time Magazine, December 21, 1998. 58. See the transcripts of the testimonies at http://cryptome.org/usa-v-ubl-dt.htm. 59. See UPI, citing The San Francisco Chronicle, October 21, 2001.